Though not without its frustrations, registration for the Race to Robie Creek trail half marathon went much more smoothly than the previous two years (previous posts). As predicted, the 2200 spots filled quickly -- in just 43 minutes -- and they likely would have gone even quicker if the Active.com servers could have fully handled the huge volume of would-be runners. Most registrants needed to befriend the F5 key if they wanted any chance of breaking through the crush of traffic. 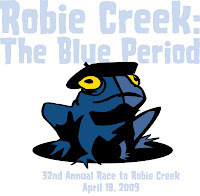 Pitched, with slight hyperbole, as "the toughest half marathon in the Northwest" the Race to Robie Creek is largely run on jeep trails and climbs 2,000 feet over the first 8.5 miles, followed by a blazing fast 1,700 foot decent to the finish.